Covered area problem is a geometry problem represented in Cartesian product. Many rectangles are located in a two dimensional environment. Each rectangle has its upper-left coordinate and lower-right coordinate to indicate its position. 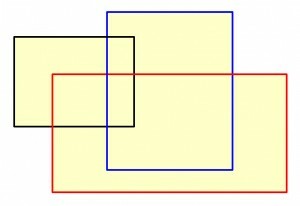 One rectangle can be placed separated from other rectangles, can be placed inside some others, or can be placed where part of it overlaps other rectangles. Covered Area Problem is a classic algorithm problem used for academic teaching purposes. The basic idea is to give several pairs of Cartesian coordinates as the input. Each pair of coordinate represents the upper-left corner and lower-right corner of a rectangle. The goal of the system is to find out the total area covered by all those rectangles. Please note that we can not just add all the covered area of each rectangles since the rectangles can be overlapped each other in any order. Common solution usually implements two dimensional flag mapping. Each rectangle will map several flags covered by it into value 1 (covered). If the flag in a location is already 1, then no change needed. At the end of the process, the program will count how many flags have value 1 and that would be the answer. 1. It consumes a huge size of memory, larger Cartesian coordinates can not be calculated. 2. Two dimensional array is very difficult to be implemented in logic and functional programming. The algorithm used in this article will work on the all coordinates of integer numbers, meaning the top-left coordinate is (-32768,32767) and the lower-right coordinate is (32767,-32768). This algorithm will divide the region into 4 equal subsections. Instead of marking flags in a two dimensional array (65526 x 65536), this algorithm will compare each subsection with the rectangles. When a subsection is totally uncovered, the value 0 will be given. When a subsection is totally covered, the value 1 will be given. When a subsection is partially covered, the value 2 will be given and that subsection will be divided into 4 smaller equal subsections, and the same calculation will be performed recursively. ((R1 + R2) &gt; 2) -&gt; Result is 2). R = 0 -&gt; Result = leaf(Filled,X1,Y1,X2,Y2)). R = 0 -&gt; Result = branch(Filled,X1,Y1,X2,Y2,Z1,Z2,Z3,Z4)). buildTree(T,,T2) :- T2 = T.
Filled = 0 -&gt; Result is 0 ). Result is Z1r + Z2r + Z3r + Z4r). Just some simple codes, they calculate everything in recursion so the same algorithm can be implemented in imperative programming language (C++), functional programming language (Haskell) and logic programming language (Prolog). C++ code is tested and compiled using Turbo C++ 3. Haskell code is tested and compiled using Hugs98. Prolog code is tested and compiled using SWI-Prolog.